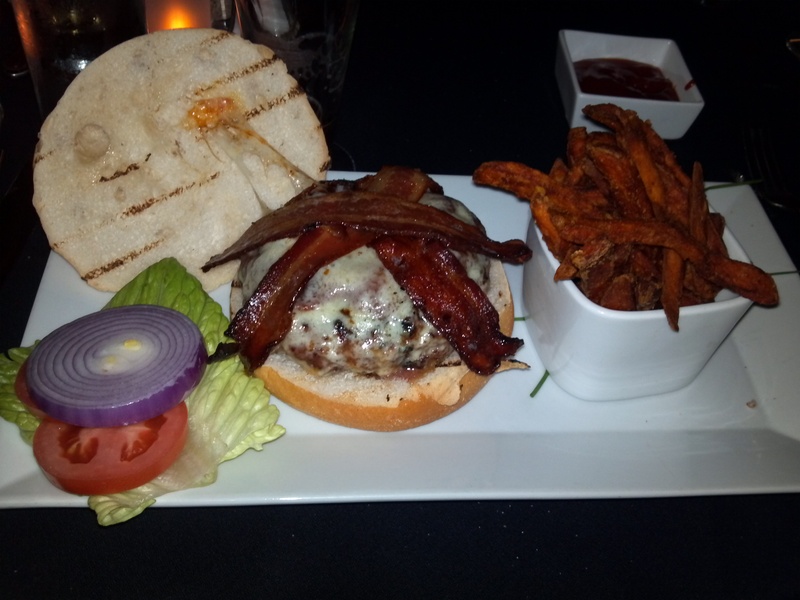 That thar’s the Drunken 10n Burger from Nicole’s Ten, an upscale gastropub in Randolph, New Jersey. They have 150 craft beers available; I sampled the excellent County Line IPA from Neshaminy Creek brewing, hoppy to an almost syrupy extreme, and the Muddy Creek Lager from Defiant Brewing, which had a nice chocolaty flavor, but needed to be a bit more defiant. But let’s get to the burger. This one is a real fancy pants deal- black Wagyu beef and wild boar cooked in “cranberried old vine Zinfandel” and topped with Havarti cheese, maple pepper bacon, and a peach bourbon BBQ sauce. It was voted one of the top 10 burgers in New Jersey at the NJ Wine & Food Festival, and it belongs there. The beef, bacon and peach flavors work well together, though I couldn’t taste the herbs de provence or the “old vine Zinfandel.” The cheese coats the burger in a thin layer of creaminess. For me, a burger is all about the meat, and the “Kobe” black Wagyu cut with wild boar made for a firm yet tender and flavorful burger, even if it seemed a bit more medium than rare. The sweet potato fries were creamy inside and crisp on the outside, probably the best I’ve had. Everyone else’s meals were well received- we shared a lobster mac ‘n cheese with whole claws and chunks, tasty crab wontons, and the fish in the grouper taco was perfect. Crisp, not overcooked, lots of flavor. The seafood pot pie looked insanely good, and Firecracker’s “Going Coastal” pasta was a delicious take on frutti di mare. Even the kids menu mac ‘n cheese was delicious. The desserts were as crazy as you’d expect from such a place, the type of decadent, over the top food meant to make you forget that the world uses your face for toilet paper, and damn it, you deserve a devil’s food cake on top of a cheesecake covered in frosting, because hard drugs are so gauche. Anyway, good place for a burger and a beer if you have forty bucks to drop on them with tax & tip. I think it’s made from PETA members. Good one! I always wondered where Kobe beef came from… Now I know. Is this why you can’t buy Kobe brains? Tom, I just want to follow you around and find out where all these cool places are! Just wanted you to know how much I’m enjoying these food reviews. I used to be a restaurant critic for the Ann Arbor Observer, so I know how hard it is to describe food. Thanks, Margaret. My Italian side makes me Live to Eat (the Irish part handles the bibacity) so I’ve spent a lot of time learning to describe food. Thomas, Good Article. Have you been to another good restaurant/gastropub in Randolph, Morris Tap and Grill? They have a good selection of burgers. Voted one of the five best burgers by cbs or abc. Worth a trip. yes! I had the baconeater at the Morris tap and grill. love it!